The General Dynamics GoBook MR-1 is being touted as the first rugged, Vista compatible, ultra-mobile laptop offering a sunlight-readable LCD screen. The laptop’s 5.6-inch touch-screen features DynaVue – a patent-pending display technology that allows viewing of a colour LCD screen in direct sunlight. 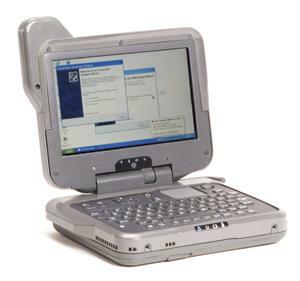 Weighing 900 grams and measuring 40mm (H) x 152mm (W) x 110mm (D), the GoBook MR-1 is said to be small and light enough to be operated as a handheld computer. The machine is designed specifically for use outdoors and incorporates technology originally designed for use by the US military. According to Sydney-based Australasian distributor Avantec, the GoBook MR-1 can survive coffee spills, dust, rain and the occasional drop from a height of 900mm onto a hard surface. The laptop comes with an Intel 1.2 GHz Core Solo ULV processor, a 533 MHz FSB, 2MB L2 cache, up to 1GB memory and 3D Intel Extreme Graphics with up to 128MB of graphics memory. It also includes a global positioning system, 802.11 a/g/n wireless, 3G/EVDO data comms and Bluetooth.